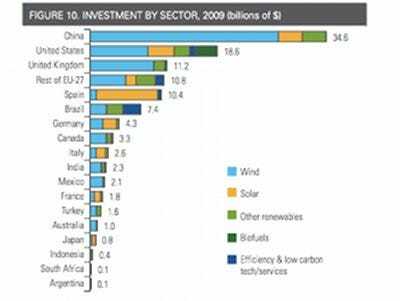 Even with many American disadvantages, it’s embarrassing to fall behind in green tech investment to a country with a 70% smaller economy. A new Pew study shows China slaughtering the U.S. in wind investment and keeping even with solar (via FT Alphaville). Looking at investment compared to overall economy, China comes in third at 0.39%. America comes in eleventh at 0.13%. American disadvantages in the tech race are the same as any old generation trying to learn a new technology. We’ve already built the old infrastructure and don’t see the need to change.